Spring brings promise. After a long harsh winter, the lifeless landscape starts to stir. Both skunk cabbage and trilliums emerge as soon as the snow is gone. The willows along the river sprout leaves. In the forest, I can hear the songs of robins and sparrows. The warmer days are refreshing as I don't need to bundle up. Gone are the toque, layer of shirts, gloves and jacket. I can wear a sweat shirt without fear of succumbing to the elements. Steelhead Alley is the southermost range of steelhead in North America. While not native, they've adapted well to Lake Erie. Spring comes early here usually late March and early April. It's not uncommon to have days in the upper 60s and 70s. It's a beautiful day on the Upper Grand. It's first light when I park on the hill. I step out and feel the cool crisp air. As I dress, I can hear the goobles of turkeys off in the distant. I cross the road and head onto the trail. The walk down steep as I carefully go over logs and try not to slip on the mud. The riverine forest is full of bird songs. Off the trail I can see the several plants emerging quickly before the trees sprout their leaves and rob them of sunlight. Eventually I get down to the river's edge and walk through the sedge meadows. In a few months, these meadows will be waist high. I look at the river and running that off color that the Grand is know for. It's been a couple weeks since we had rain and I take full advantage of it. The Grand is the largest of the Alley's streams and during the spring it can take a week for it come down. I cross over the river and I'm not far from the spot I want to fish. In the distance I see my spot and on the other side is the large stands of sycamores. I stand on the bank and scan the waters. The sun has come up but not over the ridge. 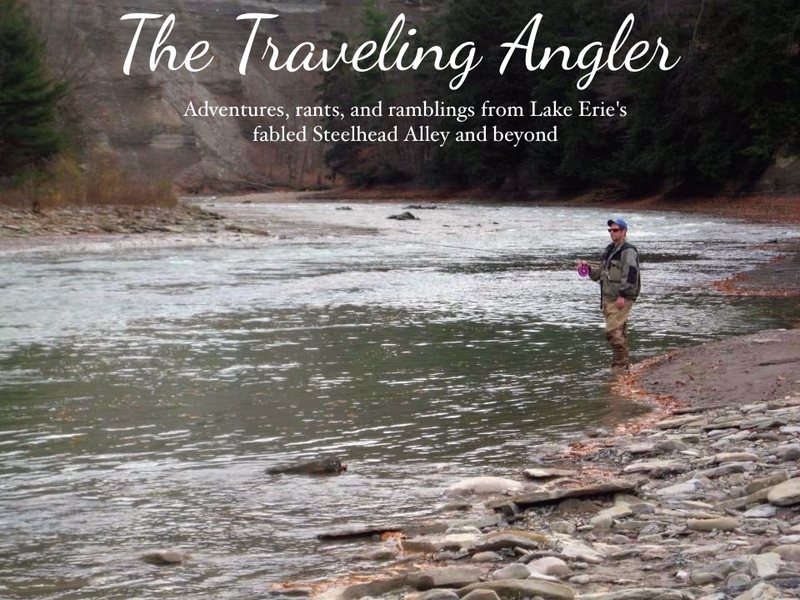 Somewhere in the murky waters are steelhead. The pool above spills into several riffles. The riffles are chock full of gravel. If it was any other river, I could make out the distant shadows of fish spawning. But, I'm not after them. I have never fished redds nor will I ever. I follow strict code of fishing. I quietly wade into the water and start to fish. The pool here is shallow probably about 3' deep. Somewhere in the pool are drop backs. 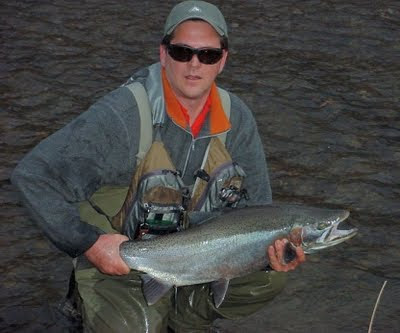 Drop backs are steelhead that have finished spawning. They move into deeper water to regain their energy. The spawn is hard and their bodies show the ravages of it. It doesn't take long for me get into fish. The fights are hard and in some cases long drawn out. All of them are spawned out hens. No longer fat but, sleek in a bad way. They looked emaciated as the bottom of their bellies are sunken in. Their bodies are scarred and the bottom of their caudual fin are worn out from digging out gravel. It amazes me that a fish in that bad of shape, can expend the energy to fight like a fish fresh out the lake. I release them and they quickly dart back to the run. Tomorrow these fish will be from this spot. They'll gradually head downstream, but at their own pace. If the river had blown out, they would of rode the current all the way back the lake. There in the lake, they pack on the weight they lost and within a few months, they'll head back upstream. I take a break from fishing and get out of the water. The sun is now over the ridge and I see through the murky haze. I spot the shadows of several fish. Suddenly I see the flash of the hen and plume of mud comes up. She's digging out gravel to lay her eggs. The largest male get the right to mate and others are forced to sit back. This will continue for several days until she's exhausted her supply of eggs. If there were two males of equal size they would of squared off and scrap. They bite at one another and cause a commotion. There's none of that today. Once in a while, I'll the dominant male chase off a smaller one. By next week, if we don't get rain, this spot will be quiet. The only evidence will be the holes in the gravel. Sadly this fish will expend all that energy for nothing as the Grand has too sediment and source of groundwater to keep the eggs cool during their incubation.